Jack’s wake was a first in San Diego or probably in the whole US. 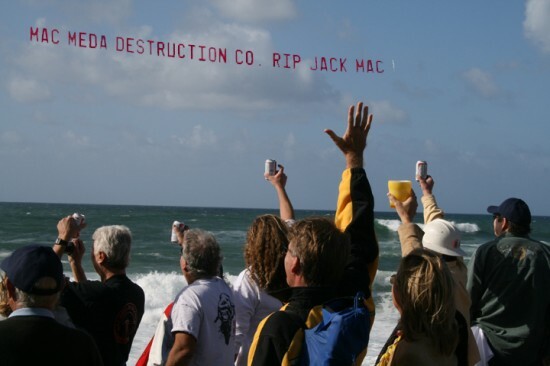 Never has there been a RIP banner such as the one that flew by Windansea in Jack’s memory. 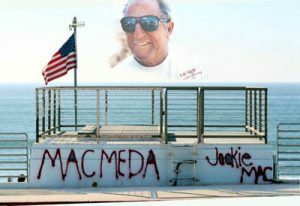 The crowd stood cheering and toasted as the plane flew over the 300-plus mourners that filled the parking lot – a day that will always be remembered for the great person he was. 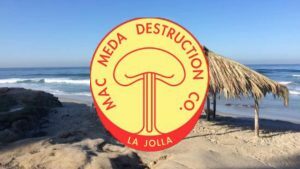 His longtime friend Doug Moranville and Karen his wife from the Branding Iron (Mac Meda T-Shirts) hired the plane and snapped the shot.